There are a lot reasons why I am a fan of Coca-Cola. However, I have one more reason today and it trumps all the others. I can’t remember ever not loving a Coke. Some of my fondest childhood memories included a Coca-Cola, as it is formally known. Perhaps the greatest of these was sitting on the front porch of the little white house belonging to my grandmother; we called her Mother Bruce. She would walk out the front door holding a couple of cold Cokes. There was absolutely nothing better than swinging on that green porch swing with her, both of us drinking a Coke. Coke was highly esteemed where I grew up. We all wanted a Coke because that is what Bear Bryant drank while munching on Golden Flake potato chips during his day-after-the-game T.V. recaps. To this day, I crave a Coke and Golden Flake every time I watch the Crimson Tide of Alabama take the field. Coke was the drink for me. Not all memories of Coke are happy. Two sad events marked 1985. Mother Bruce passed away and, fittingly, Coca-Cola made one of the biggest marketing errors in history when they decided to do the unthinkable and introduce New Coke. Upon hearing the news of New Coke I went and purchased bottles of The Real Thing. I still have one unopened bottle of the old Coke. I plan to take that last bottle to heaven with me and share it with Mother Bruce—I just haven’t figured out how to get it there. My office at my first job out of school was graced with a display of my collection of Coke bottles. I had a collection of a couple dozen commemorative bottles which I continued to add to until I sold the collection. I have, however, kept a remnant of Cokes purchased on trips to various parts of the world. 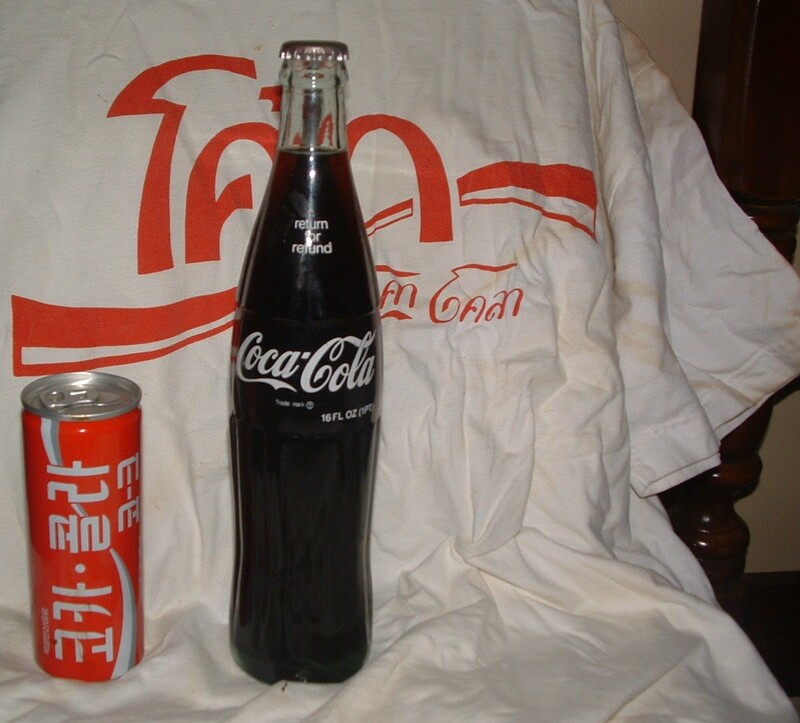 On one trip I purchased what soon became one of my favorite shirts; it is a white cotton t-shirt with Coca-Cola written in Thai and with the distinctive red Coca-Cola swirling branding. It is old and tattered now, but I still wear it when working in the garage or yard. While taking some graduate classes at East Tennessee State University my professor gave us a project to analyze and report on a corporate annual report. I wrote the Coca-Cola Company in Atlanta and asked if they could send me their Annual Report. They graciously granted my requests and I successfully completed my finance project. When our family moved to Atlanta 13 years ago, it wasn’t long before we made a trip to the World of Coke. Even to this day, we have a tradition where each December our family table is graced on Christmas morning with a Coke—always in a glass bottle. Coke is stamped on my heart, primarily because of the many happy memories I have associated with a cold Coke. However, today I have even greater reason to commend Coca-Cola. While Coca-Cola made a horrific marketing decision in 1985 with New Coke, they have now made their best marketing decision ever recorded. Today, I congratulate Coke. Today, I have become an even bigger fan. For, yes, Coca-Cola has enhanced their image and made a brilliant hire for their marketing team. Congratulations Coca-Cola, Amber Bruce—my daughter—will serve you well. Great blog Jack and congrats to your daughter on her new position!! I love it!!! Great story!